Now that you’ve planned your map (part 1 of this series), and have all the information collected that you’ll need, its time to figure out the best way to use that data for your map. There are lots of options for creating a map online. Depending on what CMS system you use for your website, there may be a plugin available. There are also many third party service solutions for making online maps, which we’ll go over in this post. We’ll also touch on using a custom dev team. Using an online third party service for making a map can take make your cartology experience a little easier. These pre-built systems are ready to go, out of the box and usually have some pretty nice features to make your map helpful for users, like categories and filtering. Here are some examples of public art associations and programs that have used online software to create maps of their collections. Lancaster Public Art uses Esri to create their interactive public art map. 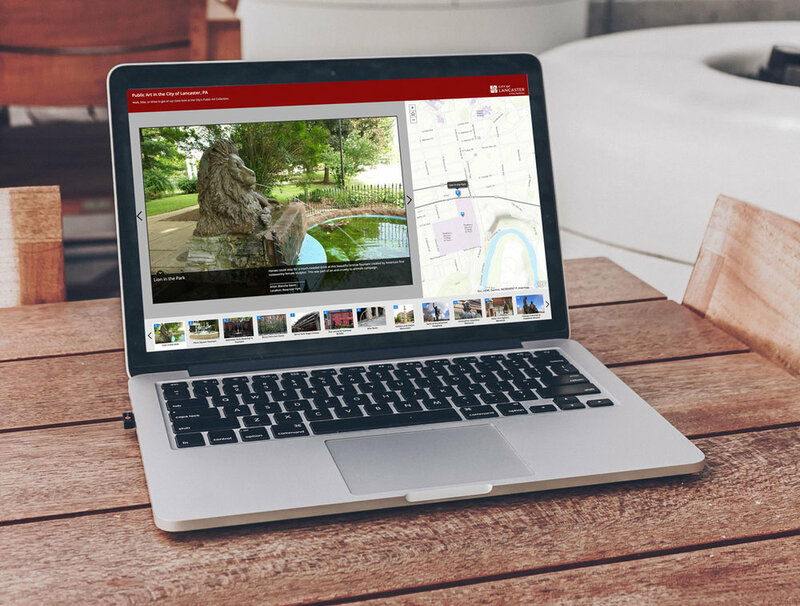 The map has large photos and the ability to add ample information about the public art piece like a description, location, designers and architects, and more. Maps Marker was used to create this interactive map for Newport News. The interactive map on Newport News Public Art Foundation’s website was created with Maps Marker, which works well with Wordpress. The map gives options to link to another website page with full description and photos of the art piece. There are quick links on each listing to get directions and ability to add filters. 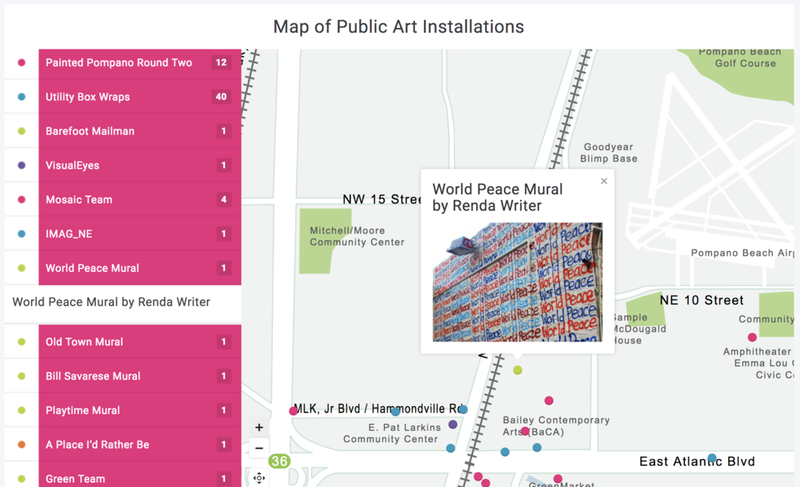 Pompano Beach Arts uses Mapplic for their map of public art. Pompano Beach Arts used Mapplic to create this simple, visual map for their public art collection. Their public art pieces are categorized in friendly, easy to use tabs. Clicking on a dot creates a small pop up window with the title of the piece and a picture. Mapbox is a great online map builder solution that is quick and easy to use. There are many options to make your map special and work just for your organization. Google Maps is always a go-to option for making custom maps. With their user friendly interface, getting a map up and running is easy. Using a qualified, experienced web development team is also a route to take for your map. This may be more of an investment than using an online solution, but if you have big dreams for your map, you probably won’t find an out of the box solution to meet your needs. Here are some examples of custom developed online maps for public art collections. Association for Public Art (Philadelphia) has a really simple and easy to use map for their site visitors. The pop ups from the location markers give the user an option to learn more about the art piece. The site was created by Bluecadet. So you have your map built - now what? The fun isn’t over! There is so much you can do with your map to market your organization and collection, which is what we’ll be going over in our last post of this series called “How to create an online map for a public art collection: Marketing your map”.